"The pit of a theatre is the one place where the tears of virtuous and wicked men alike are mingled." France's political position as the most powerful nation in Europe during the reign of Louis XIV was reflected in the preeminence French literature attained in the 17th century. This Golden Age literature still forms the foundation of French liberal education. The period showed a continuing trend toward the reinforcement of royal authority and, except at the end, of Catholic influence. In 1635, Cardinal Richelieu created the Académie Française with the aim of regulating language and literary expression. The conflict between two literary tendencies  one toward greater creative freedom, which modern critics call baroque, and the other toward an acceptance of literary rules  had been virtually resolved in favor of classicism by 1660. The components of this creed would be codified by Nicolas Boileau-Despreaux, the founder of French literary criticism, in his Art of Poetry (1674; Eng. trans., 1683), in which reason, proportion, and harmony were defined as the outstanding literary values. France's greatest dramatists emerged during this period. Pierre Corneille, whose tragic masterpiece The Cid (1637), dramatizing the conflict between duty and passion, remains unequaled in the grandeur of its conception, wrote over 30 plays, most of them, after 1634, in accordance with the Aristotelian unities of time, place, and action. He was surpassed in popularity and critical esteem only by Jean Racine, whose simpler style and more realistic characters and plot structures, as in Andromache (1667; Eng. trans., 1675) and Phaedra (1677; Eng. trans., 1776), reveal a world of ferocious passions beneath a veneer of elegant poetry. In the comic arena, Molière, ranging from the farcical to the sharpest explorations of social, psychological, and metaphysical questions, created a body of plays that seem as fresh and pointed today as they were when first produced. His masterpieces were Tartuffe (1664; Eng. trans., 1670), The Misanthrope (1666; Eng. trans., 1709), and The Bourgeois Gentleman (1670; Eng. trans. c1673). During the following century, the lively plays of Pierre de Marivaux inspired the term marivaudage, meaning the style in which the subtle psychological components of love and dalliance were portrayed by the playwright. Toward the end of the 18th century, Beaumarchais held the stage with his popular comedies The Barber of Seville (1775; Eng. trans., 1776) and The Marriage of Figaro (1784; Eng. trans., 1785), which also conveyed a subtly rebellious political message. "The virtue of dress rehearsals is that they are a free show for a select group of artists and friends of the author, and where for one unique evening the audience is almost expurgated of idiots." Alfred Jarry (1873-1907), French playwright, author. 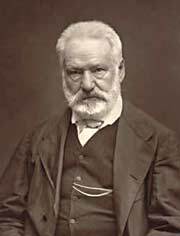 French theater in the 19th century was at first dominated by the romantic dramas of Victor Hugo, whose Hernani (1830; Eng. trans., 1830) liberated playwrights from the confining traditions of the past, and by those of Alexandre Dumas père. These were followed in popularity by the well-made plays of Eugène Scribe, Victorien Sardou, and Alexandre Dumas fils, who also defended social theses. Perhaps more than any other form, French theater illustrates the profound literary revolution that has swept France since the days of Edmond Rostand's flamboyant Cyrano de Bergerac (1897; Eng. trans., 1937). The poetical plays of Jean Giraudoux, especially the astringent Madwoman of Chaillot (1945; Eng. trans., 1947), continued to appeal to postwar audiences, as did the productions of Jean Anouilh, some smiling, some ferocious. But with Eugène Ionesco's The Bald Soprano (1950; Eng. trans., 1958), an altogether new drama, called the theater of the absurd, came into being, marking a sharp break with the past. Samuel Beckett best exemplified both the strengths and limits of this theater in Waiting for Godot (1953; Eng. trans., 1954) and Endgame (1957; Eng. trans., 1958). In these two plays the sets, the characters, and language itself disintegrate into an awesome void. The plays of Jean Genet, such as The Balcony (1956; Eng. trans., 1958) and The Blacks (1958; Eng. trans., 1960), also aim at destruction, but in a fuller, more theatrical, sacramental way. Yet however baffling and depressing these productions are, there can be no doubt that they powerfully illuminate the underlying somber concerns of the present era. Above all, they testify to the ever-present originality and vitality of French literature and confirm its enviable avant-garde role. Jean Boorsch, Professor of French, Emeritus, Yale University, New Haven, Conn.
Bibliography: Geoffrey Brereton, A Short History of French Literature, 2d ed. (1976, out-of-print); L.F. Cazamian, A History of French Literature (1955; repr. 1967); Lester G. Crocker, ed., The Age of Enlightenment (1969); Martin Esslin, The Theater of the Absurd (1961; rev. ed. 2004); Wallace Fowlie, Dionysus in Paris: A Guide to Contemporary French Theater (1960); Grace Frank, The Medieval French Drama (1972); Jacques and June Guicharnaud, Modern French Theater, from Giraudoux to Beckett (1967). Fodor's Paris, Fodor's Travel Publications, a division of Random House Inc., New York. Frommer's Paris From $95 A Day, Haas Mroue, Wiley Publishing Inc., Hoboken, NJ. Fodor's Exploring Paris, Fodor's Travel Publications, New York. The Columbia Dictionary of Quotations, Robert Andrews, Columbia University Press 1993. Paris Tourist Office (web site). Images: Cover of "Moliere: A Theatrical Life", from Amazon.com Books. 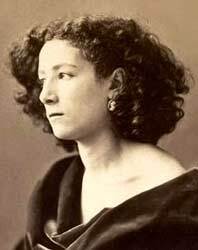 Sarah Bernhardt in costume, circa 1860, by French photographer Gaspard-Félix Tournachon (known by the pseudonym Nadar), from Wikimedia Commons. Portrait of Victor Hugo, from the British Library. All Rights Reserved. A multi-purpose database of arts organizations and venues, including dance troupes, theatrical companies, music professionals, architectural associations, cinematic events, and much more. Believe it or not, Paris has nearly 130 different theatres offering French and foreign first productions; hundreds more may be found throughout the provinces. This comprehensive database documents nearly 500 theatrical venues, and provides a current calendar of events for every region of France. An extensive resource devoted solely to contemporary playwrights and theatrical works (in French only). An exhaustive compilation begun in 1995 by André G. Bourassa (professor at l'Université de Québec - Montréal), and by Barry Russell (Visiting Fellow of the University of Oxford - Brookes), this resource is an invaluable aid to studying any dramatic works. The site also offers an extensive chronology of theatre, dating back to Egyptian, Greek, and Roman antiquity, in addition to covering the French Renaissance. Three locations in Paris offer half-price tickets to numerous theatrical performances on the same day of the show. In cooperation with the British Academy and the UK Higher Education Funding Councils (HEFCE), Oxford Brookes University hosts the web site "Théâtre de la foire à Paris", with hundreds of documents pertaining to the history of French theatre, including archives of La Comédie-Française. Created in 1987, these awards highlight the best actors/actresses, stage productions, costumes – and more – for performances of Molière plays throughout France. This Flash-intensive site (not for the meek of browser!) offers a visually unique presentation on theatrical performances and festivals. However, at this writing, it was not clear whether the dates shown for various events are for the current year – since this reviewer could not locate that data in most listings. More than simply providing a listing of theatrical events throughout France, this site's particular benefit derives from its summaries of the plays themselves, plus spectator reviews of each company's performance, comments from the actors, and press clippings. Richard Overell at Monash University in Australia maintains this page – and offers a catalogue – on rare French theatrical manuscripts. An e-zine which presents listings and news of all musical theatre throughout France, including reviews of performers, up-and-coming talent to watch, a forum for debate, and a corner for professionals to view casting announcements and auditions. A trade journal targeted specifically to theatrical professionals, stage managers and owners, festival organizers, circus troupes, et al. Excellent database of theatrical companies and venues, broken down by individual departments in both France and overseas territories. Sponsored by the Ministère des Affaires Etrangères (Ministry of Foreign Affairs), this site explores the origins and meaning of French dramatic arts. Listings of publishers, libraries, academic bibliographies, and various documentary sources. Focusing primarily on Paris venues (though offering a number of provincial listings, as well), Théâtre On Line provides both event calendars and excellent in-depth historical overviews for many theatrical companies who may not yet possess their own web sites. Consult this calendar of annual theatrical and dance festivals throughout France, featuring every genre of performances in a number of different languages – including Breton, English, French, Gaelic, and more. Built in 1735 by the playwright in the attic of his private residence, Voltaire's Little Theatre at the Château Cirey is one of the oldest stages in France. Its special historic value as one of the few remaining examples of early French theatres was preserved by loving restoration in 1999. Address: Château de Cirey, 52110 Cirey-sur-Blaise (Département de la Haute-Marne, Champagne-Ardenne) ; Guided tours: 2:30 to 6:30 p.m. – every day July to September 15, plus Sundays and holidays in May and June. User forums, candid interviews, calendar of events, professional databases, critical reviews in the press, and comprehensive links to all aspects of the dramatic arts in France. A comprehesive database of all known opera performances worldwide, including archives of over 48,000 shows dating back to 1999. Permits searches by title, composer, city or region, and performance dates, with customizable sort order. Do you know about a great theatre, ballet, or opera site we should list here? If so, please submit it!